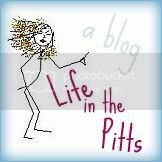 Life in the Pitts: What songs do you blast when you want to shake your booty? What songs do you blast when you want to shake your booty? I'm in a grumpy mood today. It started when I woke up and there was still some snow sticking to the ground. It got worse when I searched and searched, and there was only healthy food in the kitchen. Obviously, I've been letting Kurt do the shopping a little too often. And then my frustration boiled over when I read an email from Shutterfly telling me to update the links in a post I wrote YEARS ago. I may have overreacted to that one... But in my defense, THE POST IS 2 YEARS OLD. It felt like a slippery slope. So in an effort to get over myself, I am going to blast some Spotify tunes, and have a dance party with my baby. Any suggestions on tunes? What songs do you blast when you want to shake your booty?